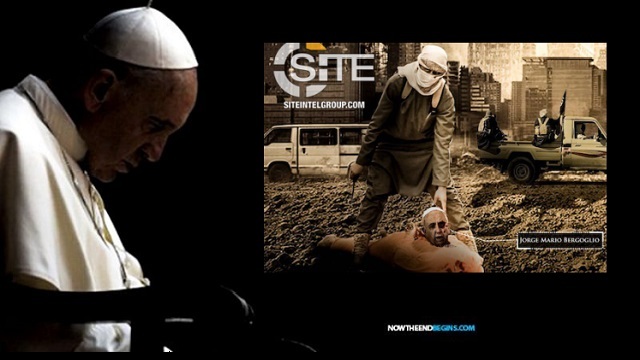 ISIS has threatened the Catholic Church and Pope Francis by showing a beheaded Pope. In Rome, security measures are clearly increased. The terrorist group Islamic State (ISIS) has made threats against the Vatican and Pope Francis and these apparently continue to increase. Now a particularly cruel photo (seen above) is circulating in Islamist networks. The work features an ISIS fighter and a beheaded Pope Francis. They were distributed by the Wafa Media Foundation. On the picture is also a text: "" Christmas blood. Wait ... "A few days ago, a picture of the ISIS was published, showing an assassin's vehicle steering towards St. Peter's Basilica.In Rome itself, security measures have been significantly increased in recent weeks. Please PRAY for the Safety of the Holy Father Pope Francis. If any Blood ... it's the blood of Jesus that covers / protects Pope Francis!